← Can creepy be high quality? Some performers keep doing the same thing for decades. They relive their past successes over and over again, to the delight of their longtime fans, who only want to hear the old favorites. Some performers (and fans) are more adventurous. They constantly develop new music, perform in new formats with new bands, and even reformulate their past catalog to the point of unrecognizability. 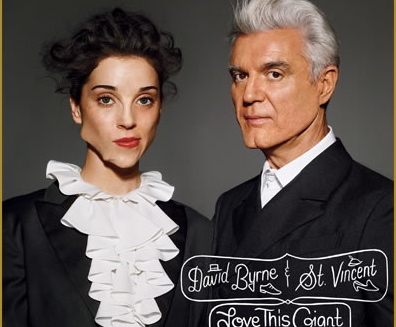 His recent concert with St Vincent (Annie Clark) at the Chicago Theater was an engaging showcase for Byrne’s reinvention. Covering mostly songs from their new album, Love This Giant, the two singers were joined by a band made up of eight horns, keyboards and percussion. The horns included trombones, trumpets, saxophones, tuba, French horn, clarinet and an occasional flute. I love horns so this made for a very happy sound. Furthermore, the horns didn’t just sit in one place and behave, as they do in most bands. No, they danced, marched, followed or led the singers, and occasionally lay down on the stage to play. Every song was choreographed like a dance performance with flashing colored spots and shadows projected against the back wall. Byrne danced around in the skittery-jittery, herky-jerky movements that I remember from the concert film Stop Making Sense. Byrne himself often played background singer among the horns as St Vincent took the main mic. I would have liked to see more of Byrne playing frontman but they did make Talking Heads fans happy with great renditions of “Burning Down the House” and “This Must Be the Place (Naïve Melody).” I would have liked to hear a duet of “Heaven” from the Talking Heads album, Fear of Music. Maybe next time.